Tomar is a small historic village 145 kilometers north of Lisbon, once a place of refuge for the Knights Templar. The remains of their fortress and a monastery are still intact and open as a museum. Buried away in one of the narrow streets of the old Jewish quarter rests the oldest existing synagogue in Portugal, built in 1438. After the forced conversions that followed in 1496; the synagogue was used as a prison, a church, a hay loft and finally a warehouse. In 1921 the building was declared a national monument and in 1939 the owner, Samuel Schwartz donated it to the state for use as a museum. A mikveh was discovered next door during excavations of the outbuilding in 1985. The Abraham Zacuto Luso – Museo Hebraico is named after Abraham Zacuto a Jewish Rabbi and scientist who became court astronomer in Portugal after fleeing Spain in 1492. His astronomical almanac was instrumental to the Portuguese and other European explorers during the age of discovery. The museum holds a small collection of Judaica, most of which has been donated from countries around the world. There are works of art, architectural fragments from local buildings, including an inscribed stone from 1307 from the Great Synagogue of Lisbon, and a 13th-century inscribed stone from the medieval synagogue in Belmonte. 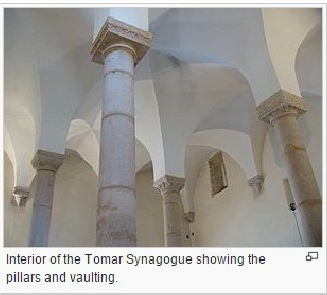 The Synagogue of Tomar is the best preserved of the medieval synagogues of Portugal. It was built between 1430 and 1460 by the thriving Jewish community of the town. From the outside, it does not look different from the other houses in the street. The current main entrance, facing North, did not exist in the Middle Ages. It was the gothic pointed arch facing East - the direction of Jerusalem - that used to be the main entrance to the temple. 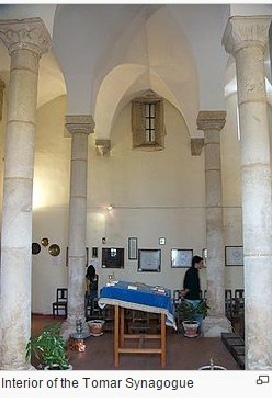 Inside, the synagogue is a square-shaped hall with three short aisles divided by four pillars supporting Gothic vaulting. The capitals bear geometric and vegetal motifs. Excavations in a building beside the synagogue revealed the remnants of a mikveh (ritual bath or women). in the 19th century it was turned into a storage house, for hay first and then as a common cellar and grocery warehouse. On 29 July 1921 the building was classified as a national monument. On 5 May 1923, the then owner of the building, Joaquim Cardoso Tavares, sold it to the Polish scholar Samuel Schwarz, who restored the building and conducted the first excavations. Schwarz donated the building on 27 July 1939 to the Portuguese government with the condition that it should be turned into a museum; in return Samuel Schwarz and his wife were granted Portuguese citizenship that protected them during the Second World War. Since 1939, the building functions as the small Jewish Museum Abraão Zacuto (Abraham Zacuto). It hosts several mediaeval tomb slabs from the whole country. Two of its best exhibits are a stone plate from the Lisbon synagogue, dated from 1307 and bearing a greeting inscription and a notable 13th-century inscription from Belmonte on which the Divine Name is represented by three dots in a manner reminiscent of the ancient Hebrew manuscripts from the Dead Sea. Other well-preserved, pre-expulsion synagogues can be found in Híjar, Toledo, and Córdoba.